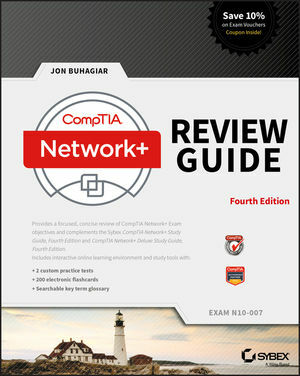 CompTIA Network+ Review Guide Exam N10-007, 4th Edition, is your ideal study companion for preparing for the CompTIA Network+ exam (N10-007). 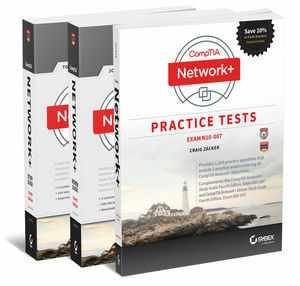 Organized by exam objectives, this is a focused, concise review guide that works hand-in-hand with any learning tool, including the Sybex CompTIA Network+ Study Guide, CompTIA Network+ Deluxe Study Guide, and CompTIA Network+ Practice Tests. The book is broken into 5 parts, each part corresponding to one of the 5 objective domain areas of the Network+ exam: Network Architecture; Network Operations; Network Security; Troubleshooting; and Industry Standards, Practices, and Network Theory. Readers will also be given access to the comprehensive online Sybex test bank, which includes two bonus practice tests, electronic flashcards, and a glossary of terms that you’ll need to know come exam day. If you’re looking for a beginning, vendor-neutral networking certification, look no further than CompTIA Network+. Jon Buhagiar, Network+, A+, CCNA, MCSA, MCSE, BS/ITM, is Supervisor of Network Operations at Pittsburgh Technical College. In addition to teaching, he has been creating course content for the past 17 years. Some of his more recent work can be found on Youtube http://www.youtube.com/networkedminds.